The Innovatron is a platform that brings all employees (and possibly other stakeholders as well) together to propose, assess, finance and implement new ideas in a venture capital way and that accelerates innovation by rewarding all participants based on the overall performances of the whole portfolio with some individual incentives for those who demonstrate greater creativity. Companies that are ahead of the curve, and start-ups, don't need what we propose because they probably already have a system to sustain innovation. For the others - the vast majority of large and medium size firms - the challenge is mostly about changing the way people think. We believe that there lots and lots of innovative people around us but that their creativity needs to be unleashed. But resurecting innovation is far from being an easy thing to do. lack of continuous questioning (trend to pursue a project until something is achieved rather than to stop at some point when the costs become undoubtedly higher than the benefits) that is the consequence of previous factors. There are certainly other factors that influence innovation as well. The previous list only includes the factors that we found the most common ones out of our experience and out of what one can read in management books and in blogs. Innovation has always been key but today we need to cope with multiple conditions at once: Europe is in financial turmoil, the U.S. as well even if they will never admit it, BRIC are the growing markets, Africa is still starving and fighting, and the climate is changing. Companies must speed up the innovation process not only to compete and survive on the market but also to make our planet a better place for all. The platform itself is designed to accustom participants to risk taking and failure acceptance. Backers are voluntarily taking risks when backing ideas and concepts but these risks are shared as no backer alone can decide. Because not all ideas and concepts will be backed, actors on the platform will learn about selection processes and that not being backed is not a failure. Rewarding on portfolio basis will allow for learning about risk management approaches and for increasing failure acceptance, in particular when a concept is not backed. Big-ism will be in first instance tackled by rewarding all ideas in the same way, whether they required a lot of resources to propose (because the pains were complicated to remove) or not. The strong focus on RoI will address the engineer-ism trend and the lack of continuous questioning. Some people are in pain because they have, or will have in the future, problems in performing their daily work. Actors want to help them to fix theses problems but to do so they need cash and time. Backers are investors: they expect maximum return and hence judge what are the best ideas and concepts to develop. To reward all participants, the Board collects revenue, i.e. project benefits. To supervise the process, the portfolio manager acts as a facilitator in linking inventors, backers and the board. There are 4 stages (pain, idea, concept, project), 4 roles (actor, backer, board, portfolio manager), 2 types of ressource (time, cash) and outcomes (revenue, reward). Don’t come to me with a problem if you don’t have a solution. This statement, often heard from even the most seasoned managers, is wrong and probably one of the greatest barriers to innovation. Some people are good at seeing problem whereas they may have no clue how to solve them. Some others are natural born problem-solvers but cannot, more often than not, correctly diagnose problems. To alleviate this other barrier to innovation, we decided to explicitly submit pains (problems) into the platform and let backers “like” these pains. This feature is very important because it does not only provide recognition for those good at seeing and diagnosing problems but also facilitate creating bounds among the see-ers and the solvers. The stage of idea is the very first stage, the “what about trying that” stage. Because we want lots of ideas, generating an idea should not consume a lot of time, a few hours up to 1-2 days maximum. The idea should be described in a compelling way (case) focusing on the pains (the problems to fix), not exclusively those published on the platform, on the approach towards a solution (the innovation), and on a rough CBA (the expected benefits). An estimate of the resources needed to transform this idea into a concept should also be provided including who should be part of the concept team (backers do not only back the idea, they also back the composition of the team to make sure the right competences are available). Ideas are competing with each other for resources. Backers will decide what they back based on how many pains the idea would remove and how “liked” these pains are and on the CBA as the objective is to support the most profitable ideas. An idea can be submitted at any time (no gate of any kind) and can even be amended (e.g. for changing the concept team) at any time. In the latter case, the idea looses all prior backers. To reinforce the wisdom of the crowd effect, we want each actor to know how many backers would vote for his idea even if they do not grant resources to his idea. To do so in a relatively simple way, backers can back more than one idea with the resources they have and resources are only locked when an idea reaches its requirement. It implies that once an idea enters into the concept stage, other ideas may loose some of their resources. Once an idea receives sufficient funding (resources) for developing the concept, a more thorough analysis starts. It is the business plan stage that obviously requires more time and possibly money (both up to what has been granted by the backers). The objective of a concept team is very clear: to produce a business plan to make a decision whether to implement or not. Different actors make one concept team, that will collaborate on a concept. But not all concepts will become projects, only the most profitable ones. As part of the business plan, the concept team should also propose a project team (that can be different from the concept team because the competences required may not be the same). Once the complete business plan has been prepared, it’s again up to the backers to decide which concepts will be implemented and which will not. 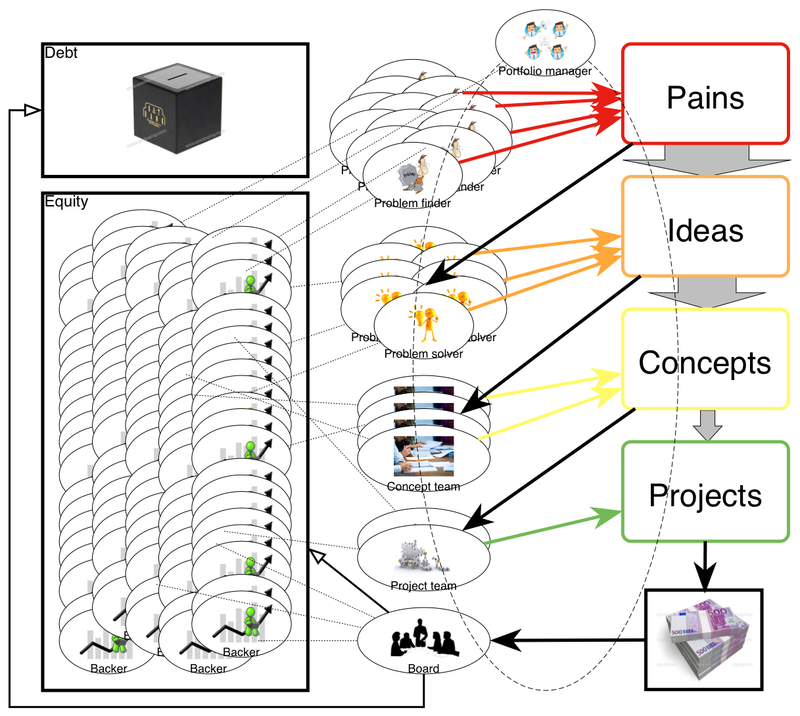 Concept teams also have an important duty, which is to report on the progress to the backers. This reporting serves a higher purpose as well: share insights with all participants about the concept team experience with this particular innovation. Like ideas, concepts are competing with each other for resources. A concept can be submitted at any time (no gate of any kind) and can even be amended (e.g. for changing the project team) at any time. In the latter case, the concept looses all prior backers. Unlike ideas, Backers cannot back more than one concept. However, they can withdraw from one and back another at any moment before a project is fully backed. We choose for this approach because we wanted people to learn to make hard choices even though we were not fully sure that the volume of concepts would be high enough, at least for the in-house experiment to really leave some room for making hard choices. But an estimate is just an estimate, and some concept will run out of resources before a proper project can be submitted. Of course, an alternative for the concept team could have been to get resources from other sources and continue the work but it would squeeze the return in an unacceptable manner. More importantly, we saw there an opportunity to learn  and decided that concepts that run out of resources will get back to the idea stage and must gather new backers before resuming work. As part of the concept, prototype(s) can be developed, which will obviously require much more resources. It should ideally be properly included in the estimation and description of the idea but if it were not planned, the concept would also get back to the idea stage for gathering additional resources. It other words, concepts can mature by going back and forth between idea stage and concept stage. Once a concept granted, it enters the project stage. This is mostly about execution here but more often than not projects are going to be in trouble and will require steering. The steering is taken out of the platform because we believe that it’s much more efficient to allocate the steering to the right committees depending on the kind of project. It does not prevent the project team to report on the progress within the platform through e.g. a monthly/quarterly newsletter. In this stage, what really matters is to report on the measured benefits at the end of the project and beyond. That’s where assessors enter into play to decide what benefits are accounted for in the platform and how frequently. It creates revenue streams for the platform, which allows for not only recouping the costs but also – and more importantly – distributing rewards. Everyone who plays an active role in resolving pains, realizing ideas, concepts or projects on the platform, is an actor. Actors are every single individual or team that mentions pains, proposes ideas or collaborates in the realization of an idea at any moment and that requests to be backed. Actors don’t have to back themselves but they will probably do so. Actors should feel rewarded (intrinsic motivation) through the support they got from backers. collaborate in a concept or a project team, on an idea, a concept or a project he didn't necessarily submit himself. Anyone on the platform is a backer. Backers constitute the crowd that will decide what pains are the biggest (the most “liked”), what ideas are the most promising and what concepts are the most likely to be profitable. No backer should be allowed to influence alone the course of a pain, an idea or a concept. Everyone who's involved in the active realization of ideas as an actor, nevertheless also keeps his role of being a backer. Backers by definition only support an idea, it is not their duty to co-realize an idea. Only when they were part of the concept team initially described in the idea, they will collaborate in the realization as an actor. The assessment board has a special role in validating the benefits of each project. The main reason for having this board instead of “just” accounting for the P&L of completed project is that our business, as a legal monopoly, has a legal mission. Hence, some of the benefits of a project may not directly profit the company but should still be accounted for in front of the National regulatory authorities. The assessment board defines the revenue streams of the completed projects (how much, how frequently, how long) based on pre-defined guidelines to avoid dispute. The financial structure will be defined to distribute benefits in a fair way considering this complex context. The assessment board acts also as the board of directors of the platform in deciding about critical parameters based on recommendations from portfolio manager(s). The Board has no impact on the content of an idea, a concept or a project. When the platform has decided an idea makes sense, all is there to start exploring. The Board only intervenes for making correct assessments of possible revenue streams. This is another special role that consists in facilitating and governing interactions through the platform, in analyzing trends and communicating about them, in reporting to the board, and performing all activities that are required to make the platform work. Even if everything can be accounted for in money, we decided to separate time (manpower) and money. The main reason was that we wanted everyone to be innovative and collaborative, whatever individual salary or rank. So, we decided to use a standard costs for manpower, the same for every single resource in the company. The second reason for doing so was that we wanted to encouraging deeds rather than outstanding subcontracting because we believe that there is hidden value in the learning and that one usually does not learn (experience) a lot from what others do. Even if the company provides all resources, we need all participants to be committed and motivated. To achieve this, we will incentivize participation, collaboration and innovation (see section about rewards). Once a project has been successfully implemented, it generates revenues under various forms. As explained before, revenues can be additional revenue from sales (of a new product or a new service or even a patent) but it can also be spared costs from increased efficiency. Successful innovators can feel better recognized (social driver). The underlying assumption is that, in an oblique way, if we achieve these 3 things, it will be profitable for the company as well because it will not only generate new revenues or decrease internal costs or both but also spill over the rest of the business with new knowledge and experience and with stronger engagement. Through “liking” and support for their ideas and concepts, actors will feel recognized for their particular talents. To further reinforce this peer recognition, to get healthy competition among actors, and to encourage breakthroughs among quick improvements, we will organize contests and award prizes. The innovatron has been designed to provide participants with space and support so that they will be spurred to assume more responsibility and will achieve more. By being able to build upon their own strengths, rather than trying to shine where they have very limited chances to do so (in their areas of weakness), participants will get more satisfaction out of their jobs. upgrade the innovation skills of individuals and create widespread accountability for innovation, by publicizing achievements, no matter how small or big they are. The first step is to obtain commitment from the management and the hierarchy. We need to officially dedicate resources to innovation. Not only management, but the complete hierarchy has to be informed that people engaging in projects, should get the freedom to work on these projects, which implies complete commitment and support of the hierarchy to the ideas behind the platform. In terms of communication, beyond the story, we will need to explain how it fits with the vision of the company and how it integrates with the current framework in place for managing innovation and enterprise projects. Next, there is the issue of resources. First, a platform is needed to create a community. Second, as state before manpower and money are critical ingredients for making this possible. As a start, we will propose to start with 1% of time (2 days), which is not much by any standard, and 1k€ per employee. It represents 3k€ per person though, assuming a cost of 1k€ per man-day. Our first estimate was 25k€ for the transformation of one idea into a concept, and 100k€ for executing one project (remember that we tend to be big-ist as well and that we need to change that). To make the system work, the company will provide debt and equity under the following terms: time and money invested will be serviced as debt and for each share each participant receives at the start (3 shares assuming 1 share per 1 k€) the company gets e.g. 2 shares. Hence, all participants - actors and bakers - would benefit from the performance of the system. Once these parameters are defined (and they can even be changed later on), the next step is to select a platform and to configure it to our needs. By the way, if we need to develop/customize something, it could be the first innovation brought by the platform itself as we could sell the idea to other companies later on (or any other business deal). We must carefully decide to build a new platform or the expand an existing one as creating an enterprise (and beyond) social network requires time and dedication. Hence a subtle trade-off will be needed between a solution fully integrated in our current practices to facilitate adoption and a new solution to show that something different is happening and that we enter a new era (if we may say so). The trade-off will have to shake the organization enough – but not too much – to make sure all employees get the message that they are welcome is this adventure. The third step will be the deployment self. The key will be here to attract participants and to help them develop the skills needed for making conscious decisions. Because running this, as a portfolio, is also a question of cash flow management, i.e. we need to avoid that all resources be spend from the start on developing concepts, and that none are left for projects - remember that only projects can deliver financial benefits. It could be wise at the start to split resources between ideas (for developing concepts) and concepts (for executing projects). To attract participants, we will need to identify key individuals that will hyper-actively participate to lead the way in defining pains and ideas. At the start, this platform will be closed as we first need to convince with the concept. Later on, it could be opened to source pains, ideas, concepts, projects, and even finance from outside the company. Of course, it requires proper care for the Intellectual Property Rights and the financial conditions. One could even imagine selling concepts to partners in exchange of royalties for example. The whole financing comes from the company. If participant become passionate about what they can achieve through the platform, they may be willing to invest their own resources into it, being money or time. In such case, we must still examine the kind of return they would get (on backed project basis or on portfolio basis) and how it fits with the strategy of the company. Good job guys.I agree with most of your statements and appreciate the symmetric 4X4 traction system you are proposing.Got a real hack spirit. If the challenge is on management innovation this Hack for me is really on top... Never seen someone managing this way ! Great.